A calendar is always by your side. When you click on any past date, it would show you the winning numbers of your favorite lottery games of the date - very convenient. An Iowa couple has claimed the $200.8 million jackpot they won on the September 23rd Powerball drawing. Tim and Kellie Guderian said they were still a bit in shock over the news. The couple said they didn't check their ticket until they saw the drawing results in the newspaper the next day. "I held the ticket and Tim read off the numbers and all I could say was, "Oh my gosh, oh my gosh," Kellie Guderian said. "We have been in shock ever since. Winning this amount of money is simply overwhelming. We have been working with a financial planner and an attorney so that we can manage these winnings in a responsible way." 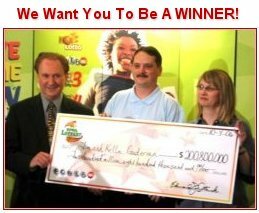 They chose to receive their Powerball jackpot in a lump-sum cash payment of $95,974,824.